This site has been a bit light on cafés in recent months. Truth be told, I’d take a starter over a dessert any day of the week. 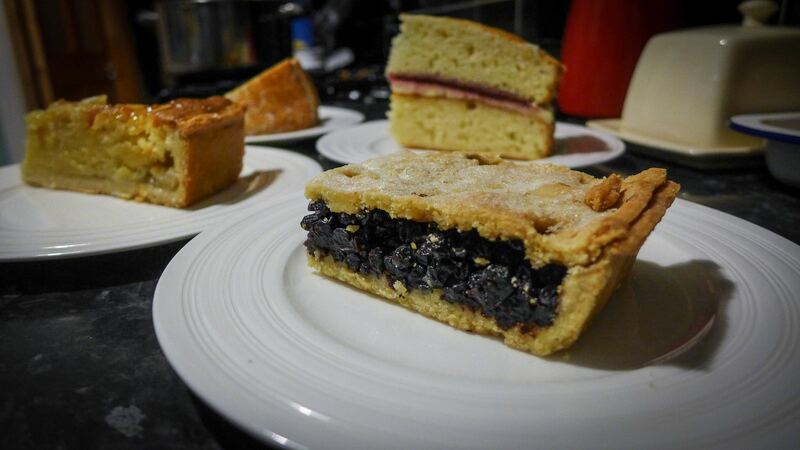 While I can admire the science and skill that lies behind a perfect risen sponge or a cunningly crafted mille-feuille, they don’t excite me half as much as a properly reduced sauce or a bit of glassy crackling. What’s more - and I realise that some of you might consider this heresy – I don’t really get “afternoon tea”. It’s not a meal; just a bunch of disparate bits and bobs, served on a cutesy stand. I’m not into cutesy, whimsy or dainty. Give me heft, depth and a decent glass of red every time. 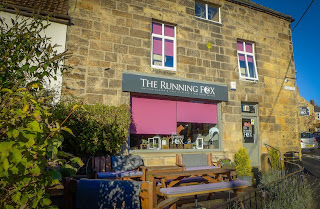 So what enticed me to the Running Fox, a self-confessed café, on a startlingly bright Saturday afternoon? First, the location. Felton, not far north of Morpeth, is easy to bypass as you zoom up the A1 towards Alnwick and Bamburgh, but that would be your loss: it’s an absolute charmer of a village. We spent quite a while taking in the lovely views from the 15th century bridge. But Man cannot sustain himself on fine vistas alone; eventually he needs lunch. 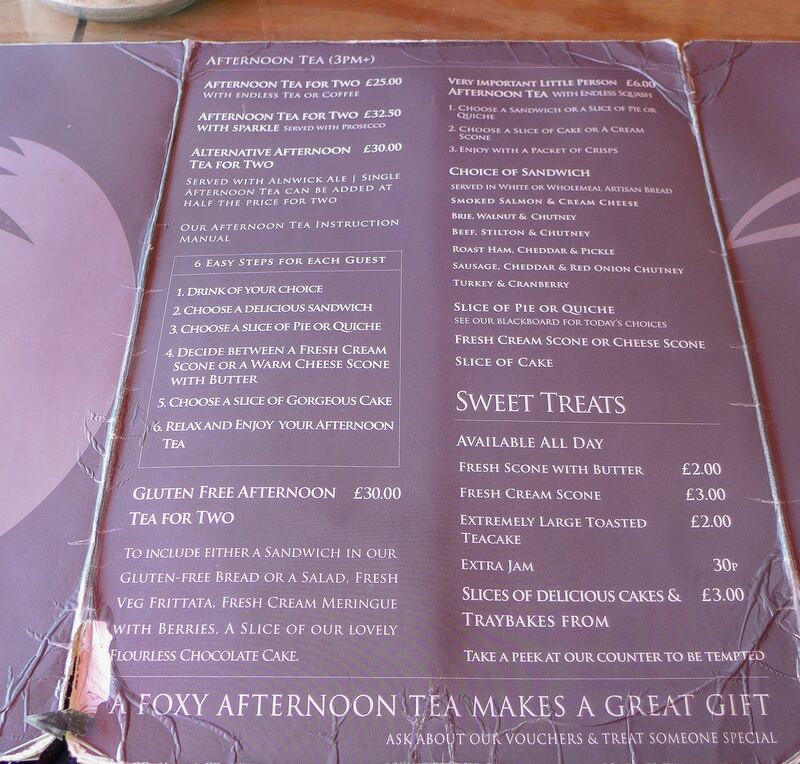 From 3pm they serve their afternoon tea, so if that’s your bag then that’s when you should go. No hard feelings. 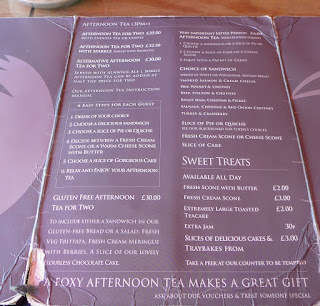 Turn up before then and you will be offered the same menu as we were (frayed edges and all), featuring lovely comforting usages of the English language, such as “floating pie” and “doorstop melt”. Before all that, we started with a few dips and things. 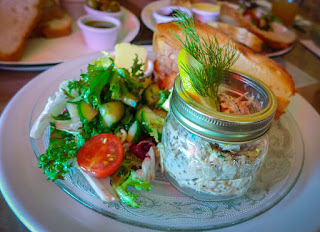 Their own-smoked mackerel pâté had a healthy twang of wholegrain mustard about it, which was needed against the butch thump of all that smoke. 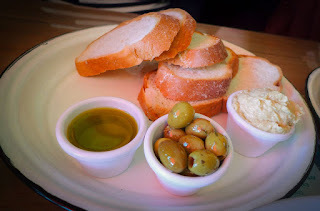 I piled it high on slices of their toasted bread, already enjoying myself hugely. A cup of Russian caravan tea, supplied by ‘lovely Caroline, Maître d’Tea of Bari Tea in Alnwick’ added to my sense of wellbeing. The proportion of hummus to bread on another plate was all out of whack (far too little of the former, though what there was, was nice). I’m also subtracting a mark for a pork pie, which, although featuring nicely coarse forcemeat, lacked any jelly. That’s just wrong. 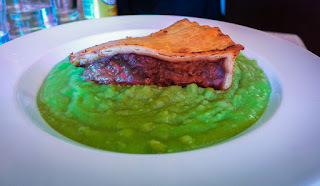 I had been curious to know what their “floating pie” would consist of, and so was Mrs Diner, who duly ordered one. A great wedge of steak pie (yes, there was pastry top and bottom, pie pedants) not so much floated as glided in like a cruise liner on an inch-thick ocean of radioactively-hued mushy marrowfat peas. 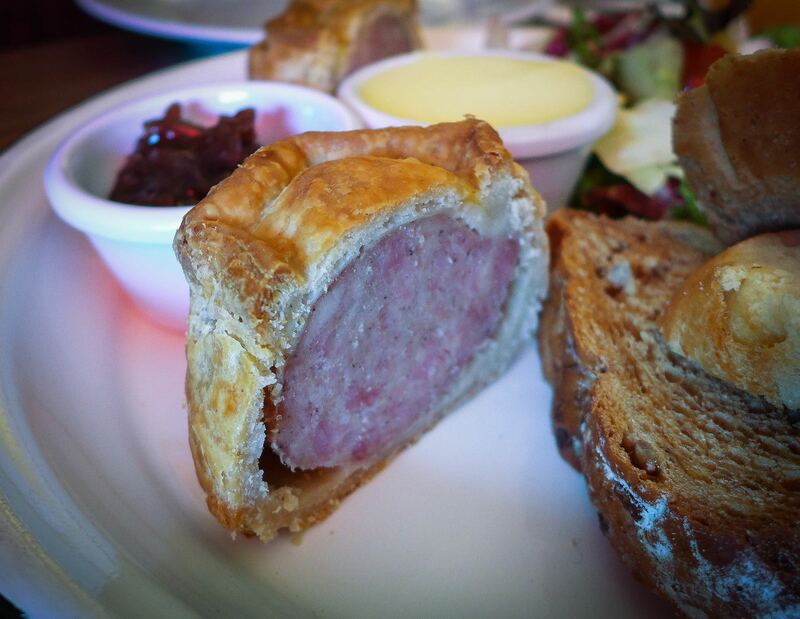 You know that steak pie with the amazing pastry that your best friend’s Nan used to make? This was exactly that: a glorious thing of real beauty. Decent roast spuds were needlessly, if enjoyably, served on the side. 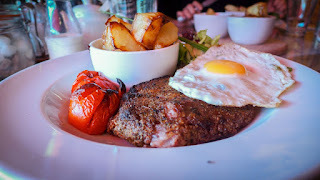 I had opted for corned beef hash on the simple basis that I couldn’t think when I last had it, nor when I might next. 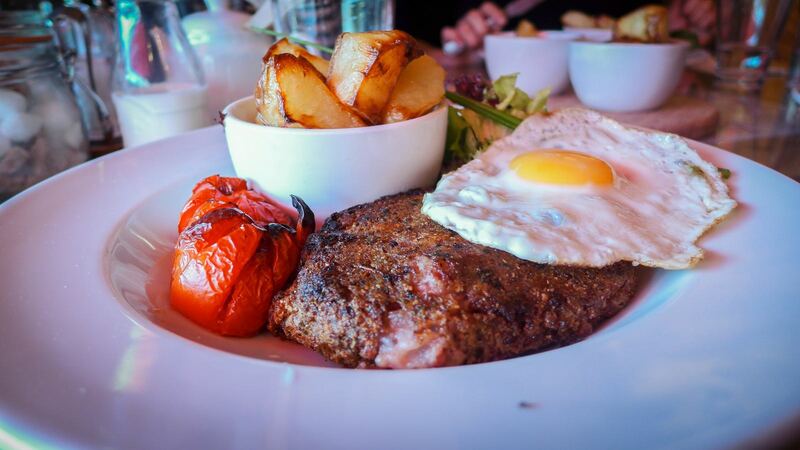 It came as a meaty, salty puck, crowned with a nicely fried egg and accompanied - because nothing goes with potato better than potato - by more roast spuds. 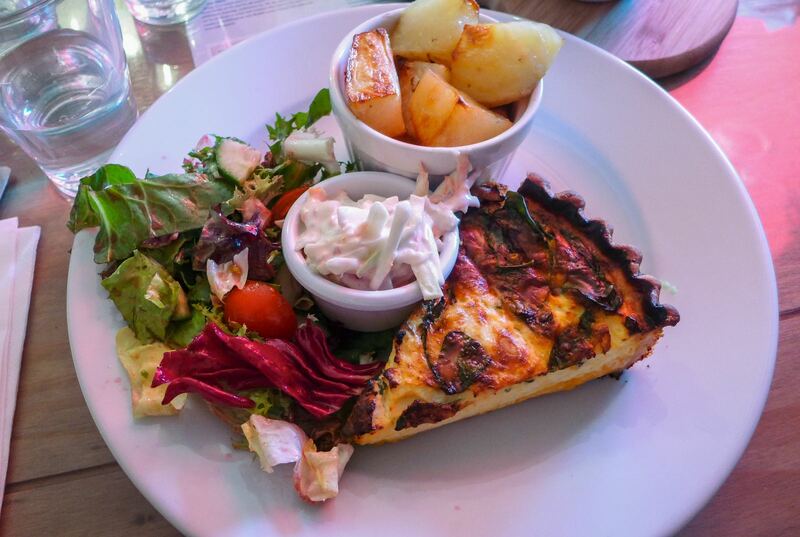 Elsewhere, a slice of quiche also found favour, featuring more fine pastry, if perhaps a little light on cheesy twang. It was accompanied by – guess what? – more roast potatoes. 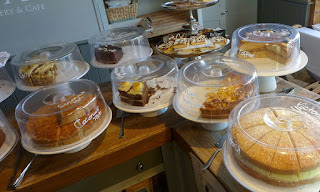 After all that starch and another round of tea and coffee there was no chance of us managing cakes without incurring a serious gastrointestinal penalty, so we took home a boxful, selected carefully from some eleven or so cakestands. These were happily consumed later - much later - after an appetite-reviving stroll on the beach at Bamburgh. Victoria sponge was canonically good, featuring the kind of light yet substantial sponge that I can never quite pull off myself. Apple frangipane pie was a fruit-laden success, but the top bake-off prize went to a dark, dense and brooding currant slice. 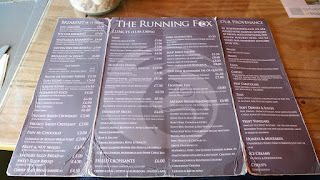 Staff were absolutely lovely, despite the place being, like our stomachs, packed to the gills. The whole shebang, including a copy of the Journal, came to just a shade over fifteen quid a head, which is a very cheap way to ensure that you won’t need to eat again all day. 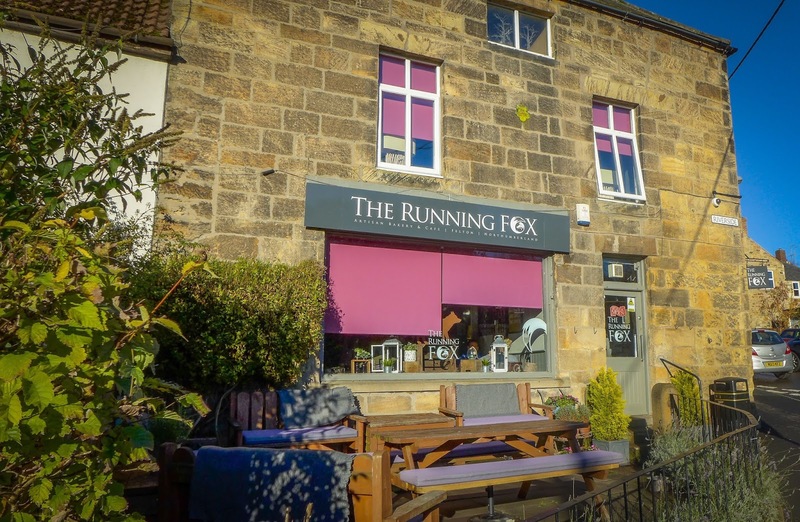 As well as being a delightful café (my published ratings criteria designates three stars for “cafés with class”, which this one certainly has), the Running Fox also doubles as the village bakery and paper shop, making for a nice mix of locals and pie-hunters from further afield. While all their bread is jolly nice, it just doesn’t quite pack the lactic tang I look for in anything calling itself a sourdough. This is a minor quibble. On the other hand, they get bonus points for offering an entire gluten-free afternoon tea, a good range of juices and soft drinks for those on driving duty and a genuine commitment to getting good ingredients from Northumberland-based suppliers. 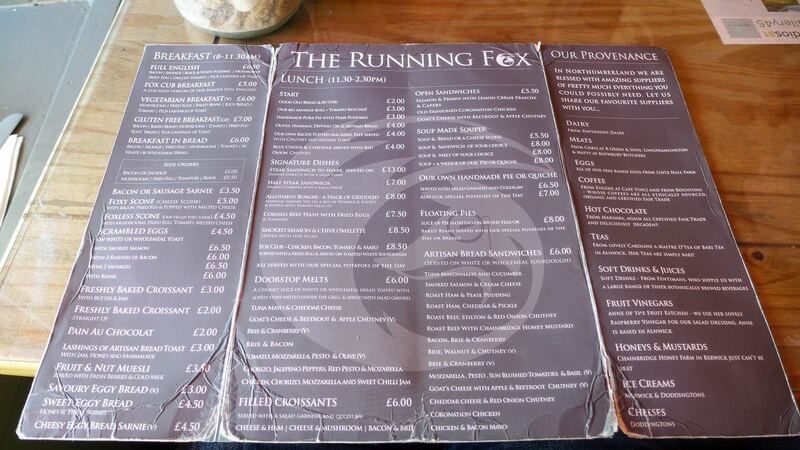 Oooh a very very picky palate - All the food that I and several friends have had at The Running Fox has always been of the highest standard - so I fail to understand why you have awarded only three stars. Readers please note that food is 4-5 stars !!! Fully agree. I think the secret diner is a bit too picky choosy. For someone who didn't try the afternoon tea it gets a lot of mentions.